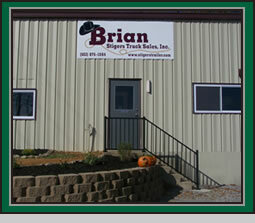 Brian Stigers Truck & Trailer Sales is a family owned business that has been in business since 1983. We are proud to say that we are the leading trailer dealer in Kentucky. We would be glad to help you with any type of trailer that you may be interested in and we can also help with custom orders. Our sales staff has years of experience and knowledge to help you get the trailer you want. Brian Stigers Truck & Trailer Sales also carries over 10 major brands of trailers from all over the country. We carry Enclosed trailers, Car haulers, Goosenecks, Pindle hitch, Skid steer, Equipment haulers, Car caddys, and dump trailers. we carry brake controls, car and truck hitches and a full line of trailer parts that we ship out daily. We can also install B & W Gooseneck hitches. We are an Al-Ko Kober Axle distributor and carry a wide variety of axle components such as bearings, seals, caps, brake assemblies, and hubs. We also carry used equipment such as skidsteers, backhoes, dozers, dump trucks, used trailers, and other types of heavy equipment to fulfill all of your excavating needs. At Brian Stigers Truck & Trailer Sales, customer satisfaction is our number one goal, we strive to offer you quality products at the best prices.